In a large stock pot, heat butter on medium high heat. Add in both onions and garlic cloves. Simmer until the onions start to soften, about 3 minutes. Add in thyme, salt, pepper, and balsamic vinegar. Mix together. Continue sauteing until onions start browning and getting a bit sticky. Add in beef broth & Worcestershire. Stir and bring to a boil. Reduce to a low simmer and continue cooking for another 5 minutes. Meanwhile, preheat the broiler. Set two ramekins or oven safe bowls in a baking dish. When soup is done, ladle into bowls, leaving ½ ” at the top. Put 2-3 slices of the baguette in each bowl. 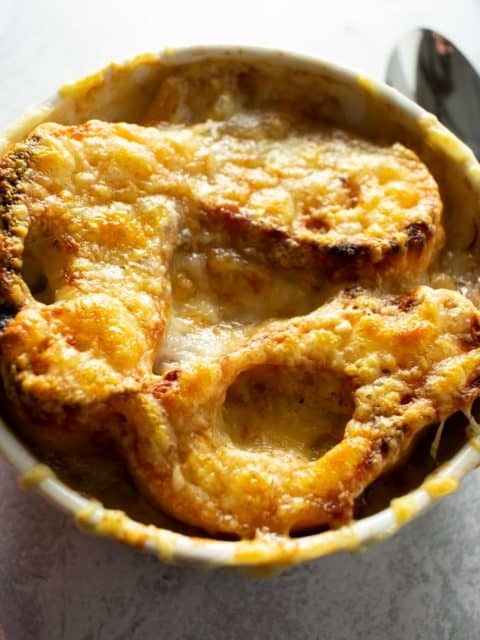 Top each with Swiss cheese and place under the broiler for 3-5 minutes or until cheese is bubbling. Let cool a bit & enjoy!